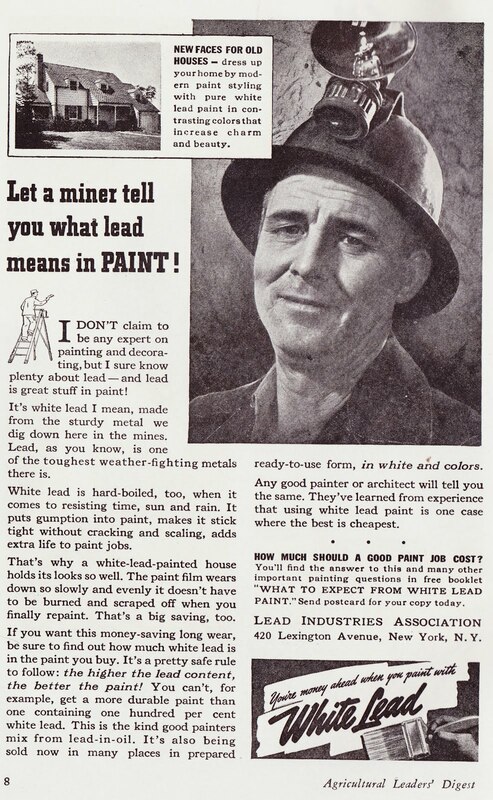 "Lead, as you know, is one of the toughest weather-fighting metals there is." "White lead is hard-boiled, too, when it comes to resisting time, sun and rain. It puts gumption3 into paint, makes it stick tight without cracking and scaling, adds extra life to paint jobs." "Any good painter or architect will tell you the same. They've learned from experience that using white lead paint is one case where the best is cheapest." "It's a pretty safe rule to follow: The higher the lead content, the better the paint!" We now know, of course, that lead paint is not at all safe. It is extremely hazardous to the health of people, especially young children. In the United States, it has been banned from household paints since 1978. And it's not just the paint chips (which children might intentionally or unintentionally ingest) that are hazardous. The mere presence of lead dust in the air or on hands can be enough to cause lead poisoning. According to the Consumer Product Safety Commission, U.S. homes built before 1940 have about a 67% percent chance of containing lead paint and U.S. homes built between 1940 and 1960 have about a 50% chance of containing lead paint. Learn more, including what to do about the presence of lead paint, from the Environmental Protection Agency. And I reckon that concludes today's public-service announcement. 1. If you do a Google search for "Lead Industries Association," a whole boatload of court cases come up in the results. Summaries of some of those cases can be found on Wikipedia and on this page at the Alliance for Healthy Homes website. 3. Gumption is a word that's not used nearly enough these days.